Foldable Snorkel Mask: New design folding breathing tube make it easy to install and portable to carry and storage. With the compatible GoPro Mount, you can attach your GoPro camera to record and share your wonderful adventure with your family and friends. With a 180 degree Panoramic Large View, full face snorkel mask offer superior views over a standard diving mask and open up a whole new world of underwater adventure. In addition, unlike curved Lens which is like a fisheye lens making everything seems to be farther away than normal, our snorkel mask with flat lens makes objects appear bigger and nearer, providing a high level of visibility. The dry top asystem prevents salt water flushing into mask. With 3 in 1 larger breathing airway, you can breathe freely through your mouth or nose, no more annoying tube sticking in the mouth cause swallowing and choking on water. And with non-toxic non-latex silicone, the snorkel mask provides maximum comfort and helps prevent skin allergic. 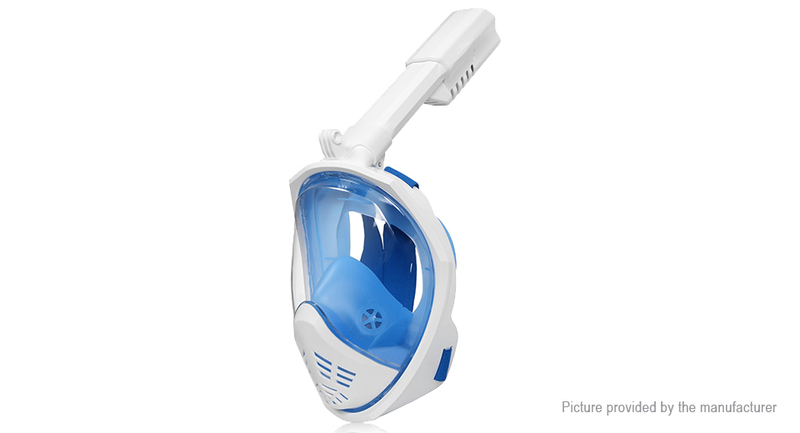 Anti-fog and anti-leakage design: Separate inhaling and exhaling airflow system creates a clear viewing chamber that prevents leaking and fogging. You can spend more time to explore underwater instead of adjusting your traditional goggle and tube constantly. The flat window brings you a real world underwater. Step 2. If the distance is less than 12 cm or 4.7 inches, Choose S/M. Step 3. If the distance is more than 12 cm or 4.7 inches, Choose L/XL.